Queen DraupadiThere are terracottafiguresdiscovered from thesites of Indus valley civilization that suggests that women had a respectable position in that society. These female figurines depict the history of this era through their adornment and overall representation. The way the figurines are adorned suggests that women enjoyed elevated status.Some of the figurines did not represent a single person, but were a divine entity of worship.There are several female figurines decorated with flowers that suggest that they were objects of worship. ArdhanareeshwarIn early Vedic period there was plethora of Goddesses to instil respect for women. 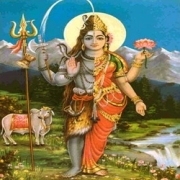 Ardhanareeshwar, was half-man and half-woman and was highly worshipped. 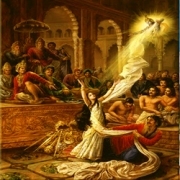 In the Vedic society women participated in religious ceremonies and tribal assemblies (sabha and vidata). There is no evidence of seclusion of women from domestic and social affairs. Women were allowed to have multiple husbands and they could leave their husbands. Widows could remarry and child marriages were unknown. There are indications of matrilineal influence in the society. Brihadaranyaka Upanishad mentions genealogies of teachers that bear matrilineal influences. There are references to women seers such as Gargi and Maitreyi. Swayamvara ceremony Women could choose their husbands through a type of marriage called Swayamvara. In this type of marriage, potential grooms assembled at the bride's house and the bride selected her spouse.Instances of Swayamvara ceremony can be found in epics, the Ramayana and Mahabharata. This continued even in the later period in high class families. 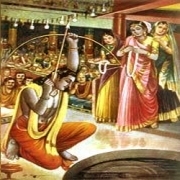 There are literary evidences to suggest that woman power destroyed kingdoms and mighty rulers.Elango Adigal's Sillapathigaram mentions that Madurai the capital of Pandyas was burnt when Pandyan ruler Nedunchezhiyan killed a woman's husband by mistake.Veda Vyasa's Mahabharata tells the story of fall of Kauravas because they humiliated queen Draupadi.Valmiki'sRamyana is tells the story of destroying KingRavana when he abducted and tried to marry Sita forcibly. In the later Vedic period, the position of women gradually deteriorated. The period clearly see the growing tendency to stratify society along gender lines. Women lost their political rights of attending assemblies. Child marriages also came into existence. According to the AitareyaBrahmana a daughter has been described as a source of misery. The Atharva Veda also deplores the birth of daughters. The system of Sati emerged in the shape of a formal custom during later vedic period. The Artharva Veda mentions that it wa customary for the widow to lay symbolically by the side of her husband's corpse on the funeral pyre. During the period of smritis women were bracketed with the sudras and were denied the right to study the Vedas to utter Vedic mantras and to perform Vedic rites. Marriage or domestic life became compulsory for women and unquestioning devotion to husband was their only duty. There are several references in the epics, Smritis and Puranas, where women and property are bracketed together. Women came to be regarded as a sort of property and could be given away or loaned as any item of property. It’s because of this the Brahmanical law did not allow any property rights to women. The provision for stridhanawas of a very limited character and does not extend beyond the wife's rights to jewels, ornaments and presents made to her. 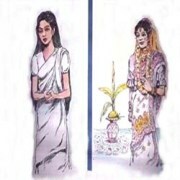 During Mauryan period Brahamanical literature was particularly severe in the treatment of women and assigns them a very low status in the society. Greek traveller Megastheneswho visited Pataliputraduring Chandragupta Mauryaruletestifies to the growing practice of polygamy; employment of women as palace guards, bodyguards to the kings, spies etc. The Buddhist texts on the other hand are much more considerate in treating women. The suppressed condition of women in the society alarmed emperor Ashokawho felt the need to appoint a special group of Mahamattasthat would be concerned only with the welfare of the women. During Buddhist rule the position of women though inferior was not as badas it came to be in the later periods. During Gupta and post Gupta period, equating women with property took strong roots. The practice of using veils by women particularly in high caste families too came into vogue. In Kadambari,Patralekha is described as wearing a veil of red cloth. However,this custom was not practiced by common people. In south Indiathe position of women deterioratedin post Buddhist period. Remarriage of widows was not allowed and they had to cut off their hair, discard all their ornaments and eat only plain food. The tonsure of widows was a custom taken over from the norththat was adopted in south Indiaduring later times.